At the Academy of Beauty Professionals, we have a deep-rooted passion for the beauty industry. We make it our sole mission to train and develop our student’s skillset, so when they complete the Cosmetology Program they are career ready. The education and training you receive with us is uniquely designed to drive our students to success. Our expert couches have extensive experience in the beauty industry and possess a sincere desire to help future professionals achieve their goals. We do this by establishing a positive and rewarding learning environment. Our mission is to “catch someone doing it right.” It’s important to us that we recognize our students when they have reached a new goal! Our cosmetology program differs from other cosmetology schools in several ways. Our students learn about more than just a single product line – you are exposed to several different product lines! This is great, because it allows you to really explore which products you prefer to work with. Grow into a creative professional through our cosmetology course. Our cosmetology school goes beyond learning the essential technical skills of hair, nails, and skin care. 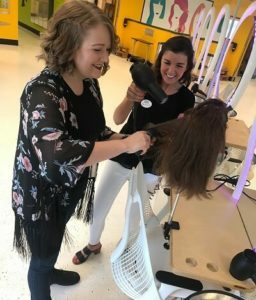 Our students graduate from the cosmetology program with a comprehensive understanding of the salon business, management, and interpersonal/customer service skills that will set you apart from other beauty professionals. Connect with us to explore your options for attending cosmetology school. Financial aid and scholarships available to those who qualify. Still not convinced? Here are 8 reasons why you should pursue a career in cosmetology.